I've done that too. Thx for the reply! I love their chargers & Powerline cables the most. I bought a small Powercore mini initially to try out along with my Mophie charging case as an extra emergency backup & loved it. Except that it was basically only for emergencies, I wanted more power so I could get multiple charges. Especially since I'm a very heavy phone user & now I play mobile games that kill my battery so fast. So I saved up & 2 months ago got the Anker PowerCore 20100 & the Quick Charge 2.0, Anker 36W Dual USB Car Charger PowerDrive+ 2 for the car to be able to use fast charging for my Galaxy S6 & have an extra port for anyone else or for an extra device. And I love both of them! I can get around 5 charges from my PowerCore before I have to charge it back up & my car charger works great for both me for my S6 & my dad with his iPhone. And right after I got those I found out about the awesome Powerline cables that were made of nylon & immediately bought one & loved it. So I bought a Powerline+ one with a travel pouch for the car to use & haven't looked back. I love the whole Anker line & now I'm looking to get some of their 2 port wall chargers to further expand my Anker merch. I absolutely love my Anker Powerport Solar 21W charger. This thing goes EVERYWHERE with me just in case I need it in an emergency. Paired with my Anker Powercore+ 10050 I always have it in my day bag. After starting to travel on and off for work I needed lots of extended power for airport time or for time when I was on site at new construction and no place to charge. The 26800 has been my favorite Anker accessory since it came out. Can't wait to grab the new version that charges twice as fast. There are different contexts where different products fit. The most common daily situation I have is I have some kind of bag to carry tablet, clothes, food,water, etc so I'm not that bothered about power's weight/size but just need a lot of flexibility. For those typical days I carry the Powercore 10000 as it has enough power to handle the one worst day I could have of using tablet+phone all day heavily with never time to plug into mains. I then also carry the Powerport 2 as it can full power charge 2 things at once. Less common situation is I'm moving with no bag, just my pockets, and for these I may carry the Powercore Slim (5000mah) as it fits well into pockets, this can make the worst possible day my phone handle everything I may do that day. I love my Soundcore IE20 headphones, I have them around my neck and plug into ears if someone phones as it keeps my hands free. Rarest situation is a long time off-grid, and for that I can either carry a few batteries (say my 5000+10000mah batteries) but I won the 9am PDT daily offer of the Powercore 26800 which means I could carry just that. Not so sure that is wise as if I were days off-grid I'd not want 1 battery which can fail but multiple batteries and much less likely all could fail. I maintain a spreadsheet of all of Anker's products with their relative size, weight, capacity, power input/output. From that the Powercore 10000 stands out as the obvious best product if you wanted to buy just 1. I like my PowerCore 5000. Have you done a volume/weight comparative analysis of a solar panel vs 2nd battery? 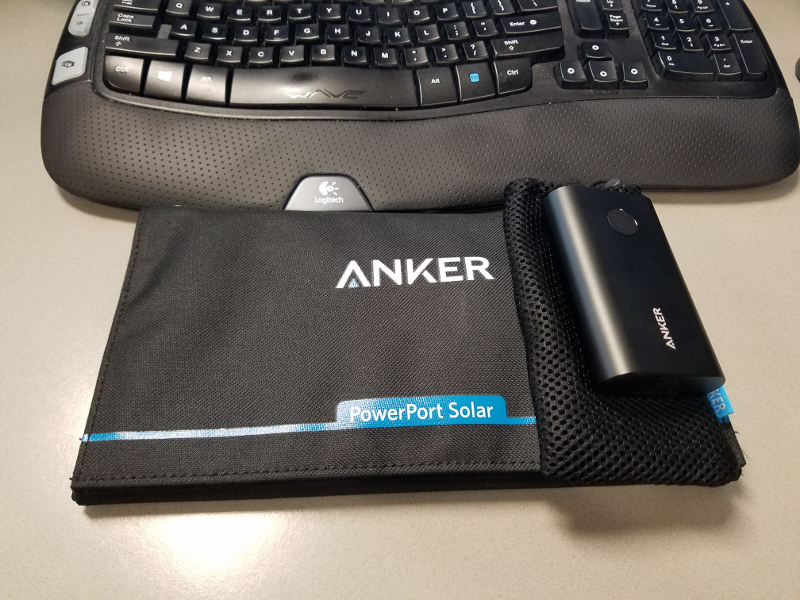 The Anker Powerport solar is "Weight :14.7oz / 417g" "Dimensions :11.1×6.3×1.1in / 282×160×28mm(Closed size)" so its cubic inch volume is 76.9 cu.in. In comparison in that volume you can carry 100,000mah (100Ah) of power which a solar panel would require 5 days of the strongest direct sunlight to produce the same power. Its weight is the more than that of carrying 20000mah of power which would need one very sunny day to produce. I really like the car charger 5 port usb charger. We always have more then one device in the car that needs power and this is a great way to charge our devices while on the move. I love my Anker PowerCore portable charger. The charge lasts forever and I can charge my phone and other devices multiple times before having to charge it. I've even used it to charge my PS4 controller while playing a video game! It's great for travel and outdoor activities like hunting, and hiking. Perfect for someone like me who loves being mobile. My favorite product that I own is definitely the 10 foot PowerCore cable. I have it plugged in at my desk and it reaches the head of my bed with just enough length left for me to be in any position I want. It is the cable I use every night to charge my phone when I sleep, so it's definitely the product I've gotten the most use out of. Anker PowerCore+ 10050mAh Qualcomm Quick Charge 3.0. It is very high quality with the aluminum frame and also charges my samsung phones fast with the quick charge technology. My favorite so far is the Anker battery pack for my iPhone. I don't have to worry about my phone battery running low anymore! The ULTRA wireless keyboard. It works well for all devices, but it gets a bit different than other keyboard since some of the button are difference than the actual keyboard. My favorite Anker product thus far is the Anker 20,000mAh Portable Charger, because it's made from high quality materials. I don't have to worry about my phone dying, when I need to use it most. Probably the PowerPort 4. It's a power house that can charge up to 2 amps per port! Plus it works great paired with one of anker's power cables. Powercore 20100, thing is amazing, can go full 4 or 5 days trips away from any sort of wall socket and will be perfectly charged up!